You may have seen this photo (at right) recently. Like many people, I’m sure, I found it incredible, difficult to believe, and inspiring. Just the act of sitting next to a lion takes a certain bravado. 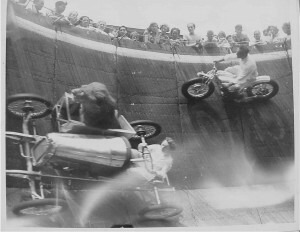 Even “tame” lions are caged—in fact, the last “lion drome” was closed after a lion bit a drunk carnival worker. Biting, it’s what those big teeth are for. So I did a little research and dug up these resources. The first link is from Sidecar Pete. He seems to have been the one to find the photo in a shop and post a digital photo of the photo online. Pete was also fascinated with the photo and linked to a New York Times article on Walls of Death from 2006 and to Thrillarena.com’s pages about lion dromes (Thrillarena Lion Dromes 1 and 2). A site called Dark Roasted Blend also has a brief history of walls of death including lion dromes with lots of great vintage photos.